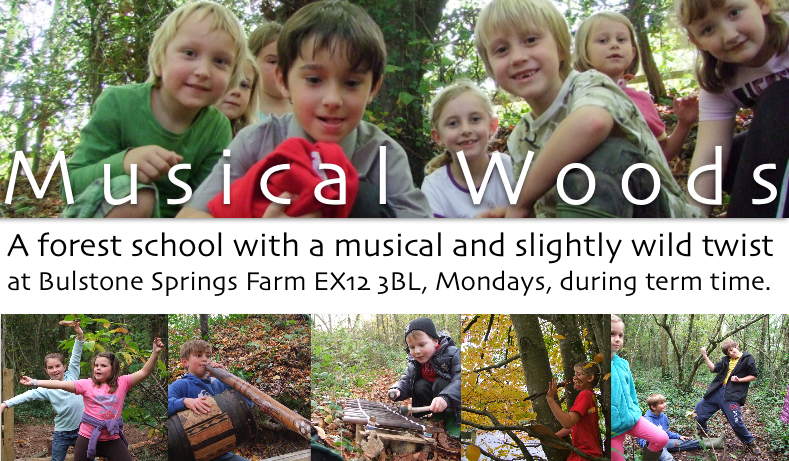 Musical Woods is a new forest school with a musical and slightly wild twist. This ‘forest school’ will be a mixture of nature connection, music making and wild play to help children and accompanying adults connect to self, to each other and to nature. Based at the gorgeous Bulstone Springs Farm, near Branscombe which is owned by Jon Theo and Laura Williams, Musical Woods has access to woodland, a shallow stream bed, some steep heathland and springs of sweet fresh water. Using a basic forest school model, with added mentoring and community building in the background, I hope that in time connections develop that support us all to live a more natural, healthy and regenerative culture based way here is East Devon. The average Musical Woods session will follow a flow of meet-up, journey to the base, games, circle time, child led play and exploration, some craft work and music making before going home. The Wild School after lunch session will depend will have a circle time, activity/play/explore session, depending on the childrens interests and needs, and then a final circle flow. Pay per half term or full term.